The 60.4 metre motor yacht Mia Elise II has been listed for sale by Merle Wood at Merle Wood & Associates. Designed by Geoff Van Aller, she was built in aluminium by US yard Trinity Yachts to ABS class and MCA compliancy with delivery in 2012. A vibrant interior by Patrick Knowles uses Honduras mahogany joinery and fine fabrics to accommodate up to 14 guests in six/seven cabins. These consist of a full beam master suite with a private panoramic deck, a VIP suite forward of the sky lounge and four doubles, all with entertainment centres, plasma television screens and en suite bathroom facilities. In addition, there are quarters for 16 crew in eight cabins. The saloon has comfortable seating, cocktail tables and an entertainment centre including a large plasma television screen and a Kaleidescape server offering on demand audio and video throughout this yacht for sale. The sky lounge is perfect for pure relaxation with seating, a home cinema with a 2.6 metre screen and a grand piano. The huge sun deck offers guests a bar, sun loungers, a Jacuzzi spa tub, air conditioned gym, sauna and steam room. A special feature is the two person guest elevator serving three decks, from the guest accommodation up to the master suite private deck. Water toys are included in the sale, comprising two sea Bobs, four sets of scuba diving equipment, a Bauer dive compressor and a full complement of fishing gear, including spear guns. Twin 3,384hp turbo charged Caterpillar diesel engines give her a range of 3,100 nautical miles at 12.5 knots and she is fitted with Quantum zero speed stabilisers. 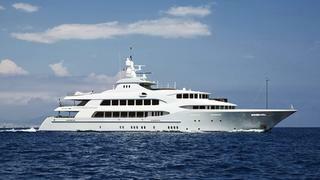 Available to view in the Western Mediterranean, Mia Elise II is asking $47.9 million.